WASHINGTON (CN) – Capitol Hill’s crosshairs turned Thursday on the Ninth Circuit just a day after a federal judge under the court’s purview became the latest to thwart efforts by the president to block Muslim immigration. The Ninth Circuit had already earned criticism from the White House in February after it ruled 3-0 against the first iteration of President Donald Trump’s travel ban. 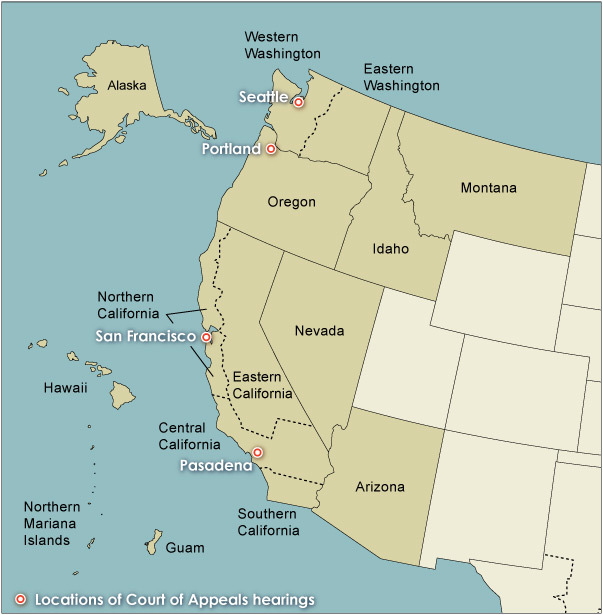 The Ninth Circuit is the largest federal appeals court in the country, overseeing far-flung federal courts in Hawaii, Alaska, the Northern Mariana Islands and Guam, as well as those in Arizona, California, Idaho, Montana, Nevada, Oregon and Washington state. Last month’s ruling had Trump to blast the Ninth Circuit as “in chaos” and “frankly in turmoil.” Republicans have long said the court is too big, too liberal and too slow, and they have tried for decades to break it up. At a hearing Thursday before the House Judiciary Committee on how to restructure the court, a partisan debate erupted over the GOP’s claims that Ninth Circuit rulings are overturned by the U.S. Supreme Court more so than often than any other federal appeals court. Vanderbilt University Law School professor Brian Fitzpatrick said he has been tracking reversal rates for several decades. Numbers compiled by the fact-checking organization Politifact dispute this. It says the Supreme Court reversed 70 percent of all cases it heard from 2010-15. Though the average for the Ninth Circuit was slightly higher than that at 79 percent, it was not the highest. Two other courts clock in ahead of it. The Cincinnati-based Sixth Circuit had an 87 percent reversal rate, followed by the Atlanta-based 11th Circuit with an 85 percent ruling reversal. Indeed the Ninth Circuit is only narrowly ahead of the 78 percent reversal rate featured by the court in fourth place, the Philadelphia-based Third Circuit. Rep. Jerrold Nadler, D-N.Y., put the Ninth Circuit statistics a different way. “Less than one-tenth of 1 percent of Ninth Circuit decisions are overturned by the Supreme Court,” he said. Thomas declined to address the second part of the question. When asked how splitting the court could affect public perception of the courts as a fair and neutral arbiter, Thomas said such a move would diminish public respect for the rule of law. “No question about that,” he said. “I hope this committee won’t engage in that kind of endeavor,” he added. John Eastman, director of the Chapman University Fowloer School of Law, meanwhile regaled the congressmen with other problems the Ninth Circuit faces. Because of its caseload, the circuit takes 50 percent longer than the others to move from appeal to ruling, with that process spanning 18 months. Describing the Ninth Circuit as the “Wild West,” Eastman said that collegiality among judges also suffers in the Ninth Circuit because the constant caseload buries its 29 judges. On top of that, Eastman said the extraordinarily high combination of three-judge panels – 17,296 to be exact – prevents a coherent body of law from emerging, and undermines the circuit’s ability to get the law right. Because of the high number of opinions, practitioners have a hard time keeping up, which gives rise to intracircuit conflicts. “Collegiality thus serves to check the tendencies of some judges to ‘fly solo,’ ruling according to their personal views rather than the clear commands of the law,” Eastman’s written testimony states. Thomas, along with U.S. Circuit Judges Carlos Bea and Alex Kozinski, strenuously disputed the notion that their circuit is inefficient, or that case law is inconsistent. “A decision by our court binds courts and litigants in the whole Western area,” Bea said. “This minimizes the risk that the law of intellectual property – copyrights and trademarks, for instance – maritime trade, labor relations, employment discrimination, for instance – will be different in Phoenix, San Francisco or Seattle,” he added. Splitting the court could even affect fishermen, he said. “This predictability and uniformity of law based on diversity of thought and backgrounds of the judges would suffer under any balkanization of the circuit,” he said. Meanwhile, Kozinski told the committee that the size of the circuit has forced it to take advantage of modern technology – like video and live streams of court hearings – to bring justice closer to the people. When the circuit heard the appeal of Trump’s first travel ban, Kozinski noted that 137,300 people used the court’s website to hear the audio stream of the oral arguments. CNN’s live broadcast of the hearing had 1.5 million viewers, and another 138,615 people listened to the recording of the hearing. All three judges expressed their opposition to splitting the Ninth Circuit up. Sens. Jeff Flake and John McCain, both of Arizona, sponsored the legislation to spin off a new circuit for Nevada, Washington, Idaho, Montana, Alaska and Arizona. That would leave only California, Hawaii, Oregon, the Northern Mariana Islands and Guam in the Ninth Circuit. In explaining reversal rates, Eastman testified that size matters as much as the ideological make-up of the court. The bigger court, the lower the quality of its output, he said, citing a 2000 paper in the Journal of Legal Studies by the Seventh Circuit’s ever-popular Judge Richard Posner. Chicago-based Posner found that the Ninth Circuit’s reversal rate was six times higher than the other circuits between 1985 and 1997. There were no state additions to the Ninth Circuit during those years, but five additional judgeships were authorized in 1984. The court did not have another judgeship authorized until 2009. Rep. Jason Chaffetz, R-Utah, asked the judges if Posner got it wrong. Thomas said size absolutely does not affect the quality of judicial output. “I think that our deliberations now are even better than when I joined the court, because of technology,” he responded. Saying the model his colleague used is only as good as his inputs, Kozinski accused Posner of focusing too much on size while ignoring context. President Jimmy Carter had from 1977 to 1981 appointed 11 of the “most liberal judges the world has ever seen,” while the Supreme Court was moving in the opposite direction, Kozinksi said. Chaffetz defended Trump’s attack on the Ninth Circuit amid rulings against his travel ban from it and lower courts in its clutches. “That’s certainly right,” Kozinski said. “And of course that would be exacerbated if California were isolated,” he added, noting that one of the reasons for having regional circuits is so that no single state dominates. To drive his point home, Lieu cited the Ninth Circuit’s 2014 ruling in Obsidian Finance Group v. Crystal Cox, which found that bloggers have the same free speech protections as traditional press.